* Cutting: south side of the bridge has been cut. Clear sailing to almost the end of the straightaway. * Flatcar 34: Zack worked to get the bolsters and draft gear on. * Car shop: Jay was installing more insulation. * Thinking: Several parties were doing heavy duty thinking work. 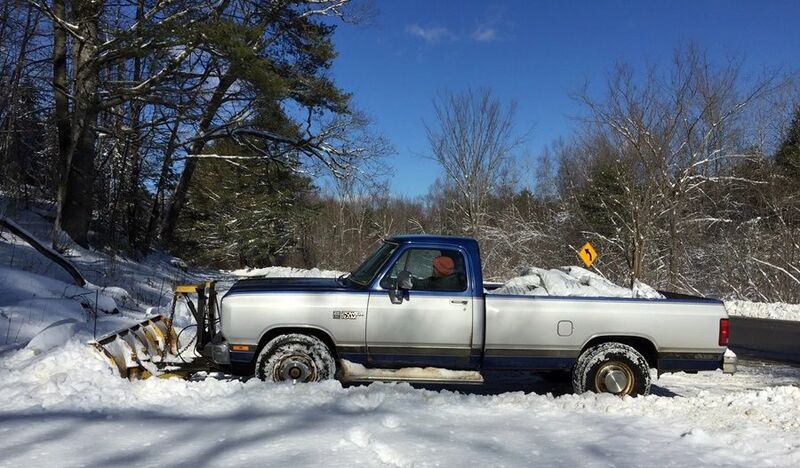 The forecast calls for plowable snow tonight- perhaps 8”. We’ll plan a late start tomorrow, to allow everyone to dig out. 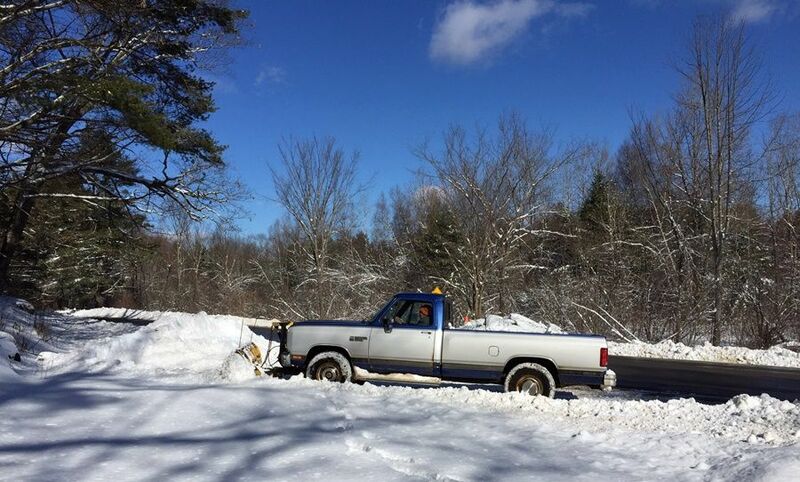 We’ll run a plow extra tomorrow, Wednesday February 13, after lunch. 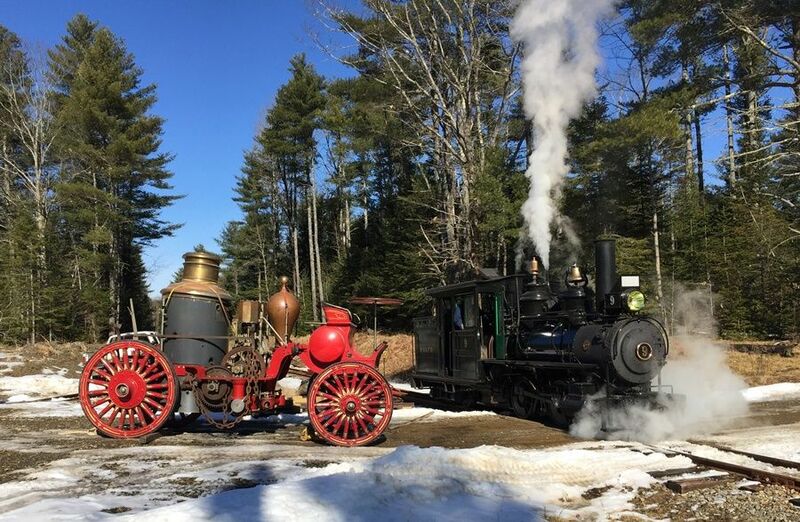 "Steam and Sleighs/Steam and Saws"
* Public steam trains on both Saturday and Sunday, with sleigh at Alna Center. * Mountain Extension: tree cutting at/near end of track on Saturday. Come prepped for burn holes in your clothing. * Whitefield Lions Club Train and Dollhouse Show: Augusta Armory. We have 3 tables, with two attendees. A third would be greatly appreciated. I leave Sheepscot for Augusta at 8. Any recent photos of flatcar 34? There are several recent photos of the progress of B&SR Flat 34 on the WW&F Facebook page. What a unique picture of 9 and the steam powered fire pumper. That is one cool photo. Should be next year's calendar. More cool photos. Thanks, Brendan. drive units replacing the front truck. The problem with a steam driven pumper was they had to raise steam to move at all. Whereas with horse-drawn steam Pumpers steam could be raised by the time they got to the fire. The horses providing the forced draft. Unless the conflagration was next door. Steam driven. Note the big steering wheel. 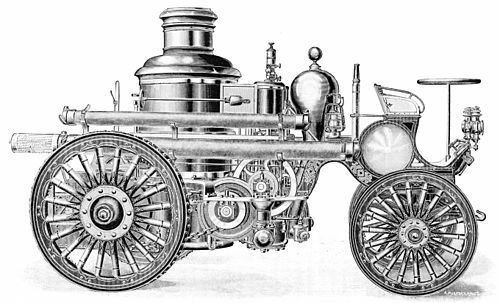 This design was a modification of the horse drawn steam pumper, and this may still have the tow points. Some steam driven pumpers may have been kept 'hot' with steam pressure in the boiler while slumbering in the fire house. That was also true in the case of some horse-pulled steam pumpers. A stationary heater for the fire engine consists of a small boiler, placed at some convenient point near the same when in quarters. It is connected with the engine boiler by means of automatic couplings and suitable circulating pipes, the entire arrangement being adapted to maintain the water contained therein at any temperature desired. Although the best types of fire engines boilers require but a few minutes time to generate a working pressure from cold water, the general adoption of the many modern improvements for facilitating the movements of the men and apparatus has made the stationary heater an essential part of a complete equipment. A very reliable and satisfactory heater for this duty is built by the American Fire Engine Company. It is fully shown in the accompanying illustrations, and explicit directions for operating the same are appended. Experience proves that the life of the boiler is prolonged by being kept constantly in a state of activity, and the elevated temperature of the water insures prompt and efficient work by the steamer at the very time when a few moments delay may breed disaster. It seems reasonable to expect that the same "house steam" system already in the fire house would have been used to keep steam propelled pumpers ready to move in short order (after disconnecting the "house steam" lines, of course).